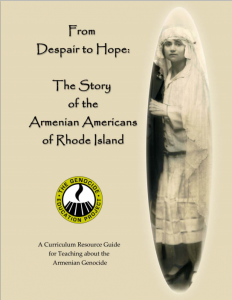 This comprehensive teacher’s manual focuses on the Armenian Genocide of 1915 during which 1.5 million Armenians, half of the Armenian population, were systematically annihilated. It includes a 1-day, 2-day, and 10-day unit with all the materials teachers will need, including more than two dozen overheads, interactive classroom exercises and more. 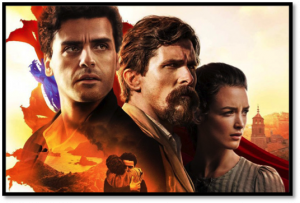 Discussions include a wide range of topics related to the Armenian Genocide: the history of Armenians in the Ottoman Empire, primary source documents, witness and survivor memoirs, maps and political-economic timelines, and the problem of denial. 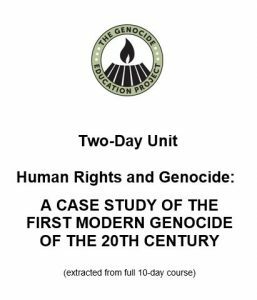 This is a compressed version of The Genocide Education Project’s ten-day curriculum found in Human Rights and Genocide: A Case Study of the First Modern Genocide of the 20th Century. It is to be completed in two fifty-minute class periods, with 2 homework assignments, one before and another between the lessons. 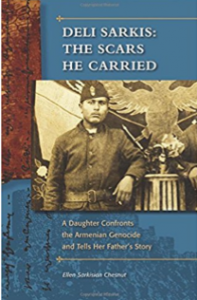 The lesson includes the definition of genocide, historical background on the Armenian case, a review of other major genocides, a short national TV news piece, and readings from survivor testimonies. 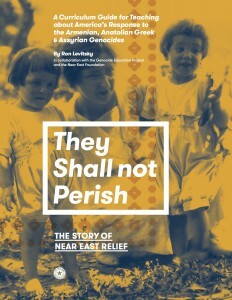 GenEd has created a discussion guide to accompany this compelling 40-minute documentary which explores a Turkish woman’s discovery of her hidden Armenian heritage and the legacy of genocide denial. How should genocide be remembered? 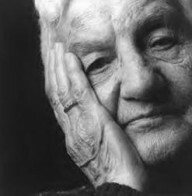 This lesson and activity begins with a classroom discussion about how communities remember major historical events, including human rights atrocities. Students also learn the allegorical story of Armenian botanist JJ Manissadjian, who studied and catalogued a rare, wild tulip found in the Armenian homeland in pre-WWI Ottoman Empire. The tulip became extinct in the wild, but was cultivated later from seeds Manissadjian had sent to Europe. 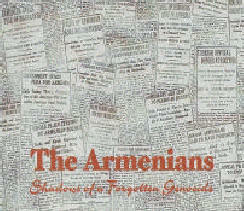 Manissadjian was imprisoned during the Armenian Genocide, but escaped and immigrated to Europe and the United States. The tulip story is symbolic of the fate of Armenians. 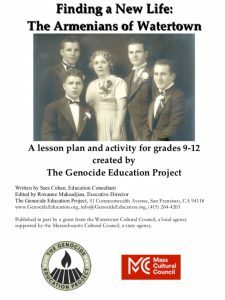 This teaching guide is based on genocide scholar Dr. Gregory H. Stanton’s work “Ten Stages of Genocide” (an update of his previous “Eight Stages of Genocide,” 1996.) The progression of stages is a formula for how genocide is prepared, carried out, and produces long-lasting repercussions. 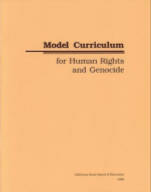 Beginning with prejudice, genocide develops over time, involving the cooperation of a large number of people and the state; This lesson helps students understand genocide as a process that can be corrected and prevented. 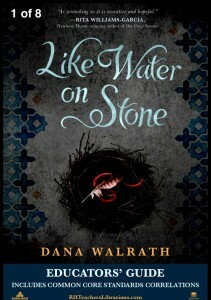 Like Water on Stone by Dana Walrath is fictional account of the Armenian genocide. This novel in verse recounts the flight to America of three Armenian children after the Ottoman Turks confiscate their family’s flour mill and murder their parents. For sixty-three days the children travel on foot, above the tree line of the Caucasus Mountains and through the Syrian Desert, to reach refuge in Aleppo, Syria. Taken in by a sympathetic Arab shopkeeper, the children disguise themselves as Arabs to avoid being forcibly relocated to the Deir el-Zor concentration camp, where starvation and barbarity led to certain death. After three years in hiding, the children finally receive a letter and boat tickets to America from their keri (maternal uncle). The book’s Educator’s Guide was created for Random House by Judith Turner, a longtime educator at Terrace Community Middle School in Tampa, Florida. It includes pre-reading activities, discussion and activity prompts and a list of Common Core Standards correlations. 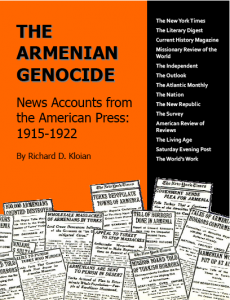 This curriculum extracts articles from the book, “The Armenian Genocide: News Accounts from the American Press,” compiled by Richard Kloian (available from GenEd and can be ordered below for $25). Including 200 New York Times articles, other journalistic accounts, U.S. Ambassador Morgenthau’s personal account of the genocide, survivor accounts, telegrams from the genocide perpetrator, photographs, and more, the book presents a compelling chronicle of the systematic deportations and massacres of the Armenians of the Ottoman Empire, perpetrated by the Turkish governing authorities between 1915 and 1922. Comprehend the extent to which American readers/public were aware of the persecution against Armenians by Ottoman rulers. 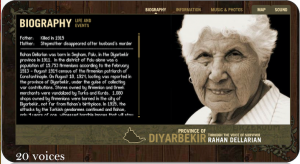 This interactive online classroom provides students a background to the history of the Armenian Genocide and the effects of the denial of the Genocide on subsequent generations. 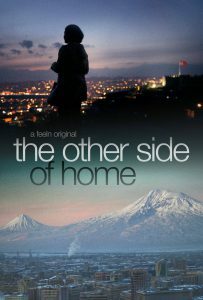 Nicole’s real life journey to the village of her grandmother, now in Eastern Turkey, illustrates the continued pain that genocide brings and the fortitude of those searching for truth. 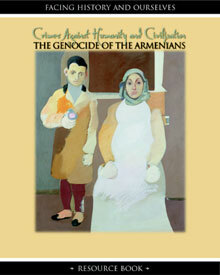 Facing History’s resource book, Crimes Against Humanity and Civilization: The Genocide of the Armenians, combines the latest scholarship on the Armenian Genocide with an interdisciplinary approach to history, enabling students and teachers to make the essential connections between history and their own lives. By concentrating on the choices that individuals, groups, and nations made before, during, and after the genocide, readers have the opportunity to consider the dilemmas faced by the international community in the face of massive human rights violations. About the Author: Simon Payaslian holds a Ph.D. In political science (Wayne State University, 1992) and is a Teaching Fellow and Ph.D. Candidate in the Department of History at University of California, Los Angeles (UCLA). 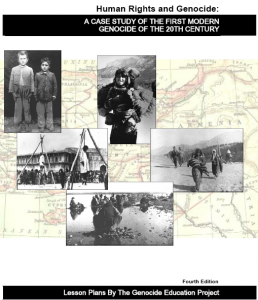 This handbook provides both a historical perspective of the Genocide and an overview of international and national constraints in preventing the genocides that followed, highlighting the world’s inability to deal appropriately with the perpetrators of the Armenian Tragedy. 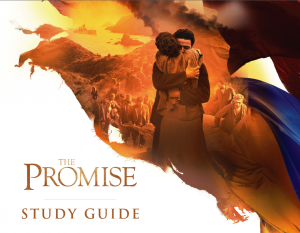 This book also provides teachers with maps, graphs, and eyewitness accounts as well as valuable teaching aids such as the worksheets, discussion and essay topics to maximize the student’s understanding of how the unspeakable can occur and recur even in contemporary times. 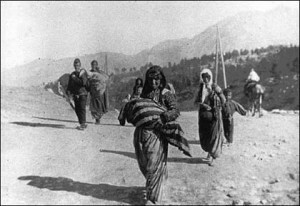 This resource guide lists books, teaching guides, research reports, monographs, archival documents, bibliographies, photographs, websites, videos, and maps available on the Armenian Genocide. Overview of the Unit – The genocides of the twentieth century elicited feelings of horror and revulsion throughout the world. Yet both the international community and the United States have struggled to respond to this recurring problem.